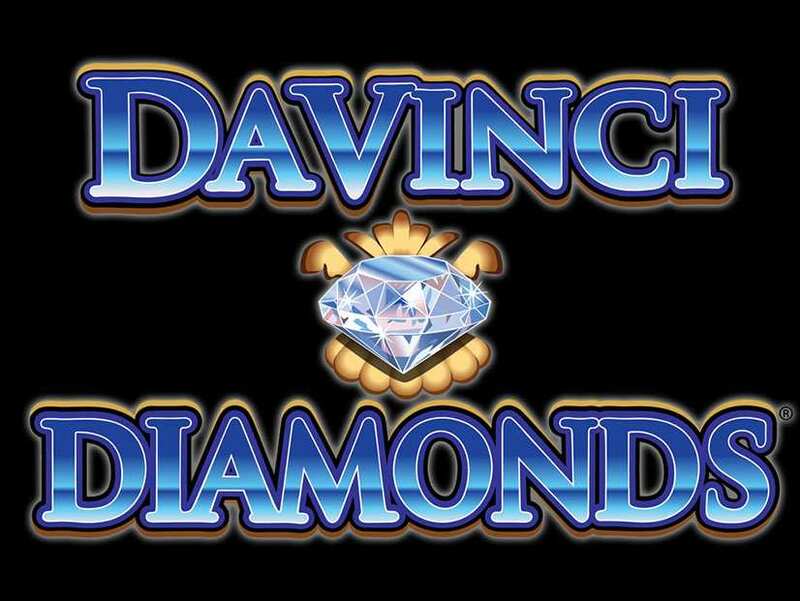 IGT is the company behind the slot machine called Da Vinci Diamonds. The theme of the title revolves around gems, the artist himself, his paintings like the Mona Lisa, Portrait of a Musician, and others. The online Da Vinci Diamonds slot machine sits on five reels, and it has three rows where the symbols land. Here, players have a chance to win on any of the 20 pay lines, and they also have the liberty to adjust their bet sizes. The machine offers some ways to augment winning chances, and it also has free spins for those who are looking forward to that kind of reward. Here is the feature summary of the Da Vinci Diamonds slot game. The online Da Vinci Diamonds slot machine is simple to operate. The only thing that a player has to do is to change the cost of the bet per line or the coin value. This button is found at the bottom of the playing screen, and it is labelled LINE BET. Use the plus and minus buttons to toggle the value of the coin. By default, you can wager between £1 and £3,000 coins per line. Whatever your selection is, keep in mind that this will be multiplied by 20 lines because the pay lines are fixed. You cannot choose how many lines to activate. If you chose to wager £1 per line, you would be shelling out a total of £20 for that spin. You have the option to change this at every spin or stay consistent with your line bet. The next thing to do is to choose whether you want to play the game manually or if you want to do it in autoplay. If you want to spin manually, click on the Spin button found at the bottom centre of the screen. It is the button that has the circular arrow icon. The autoplay function or button is located at the bottom right. If you click this, you need to choose how many times the reels will spin automatically for you. Remember that if you use this function, the Da Vinci Diamonds free online slot will keep on spinning and it will use the same bet size that you chose prior to hitting the autoplay button. It does not matter if you win or lose, the lot will keep spinning until it has used up the number of auto-spins that you chose. In the base game, you will win a prize if you successfully landed a combination of the same symbols on any of the 20 pay lines. The positions of the symbols are specific, and you must land them on those exact spots. At the very least, you must land three symbols to get a winning combo. The positions are found in the game menu. Take note that the Da Vinci Diamonds online slot will only consider a combo if the first symbol landed on the first reel. What this means is that you can land four symbols of the same kind on four specific spots but not win anything if the combination did not start from the first reel, i.e. it only pays from left to right from the leftmost reel. The playtable is shown in terms of multiplier values. Each value here will be multiplied against your bet per line. For example, let us say that you landed five symbols of the Mona Lisa five times on a pay line. And let us say that the bet per line you selected before spinning the reels is £1 for a total of £20 for the spin. In this case, the reward is 1,000 X £1 = £1,000. Apart from the high-value symbols, there are also low-value symbols if you play Da Vinci Diamonds slot game. These low-value symbols are different gems that can pay between 10x and 100x your line bet. The slot machine offers free spins and wilds. Here are the mechanics for each game component. Wild – the wild in free Da Vinci Diamonds slot machine online is a symbol that has a pinkish gem background. The symbol has the text that says “wild” on it. The purpose of the wild is to substitute for a symbol—any symbol—to constitute a win. For example, let us say that you landed two consecutive symbols of the Mona Lisa. That combo does not give you a prize because you need at least three. If the third symbol is a wild, then the slot machine will consider the wild symbol as another Mona Lisa, thereby granting you a prize equivalent to three symbols of the Mona Lisa. In this case, that prize is 50x your line bet. In some online slots, the wild has its own payout structure. However, that feature is not available in this one. The wild cannot substitute for the bonus symbol. Free Spins – there is a symbol that has a rectangular pink gem and the word “bonus” on it. If you land this symbol at least three times in this IGT slot, you will be rewarded with free spins. During the free spins, the machine will roll the reels for free. What this means is that it will play on its own and reward you with money, but you will not pay for the cost of the bet. The cost of the bet per line and the total cost of each spin is equal to what you wagered before you won the free spins. For example, if you wagered £1 per line and you won 10 free spins, the machine will use £1 as a bet per line on the ten free spins, but it will not deduct that amount from your balance, but you will win cash prizes like as if you wagered £1. Tumbling Reels – the Da Vinci Diamonds free online slot has a feature where if you won a prize on a spin, the symbols that make up the winning combination will disappear. Then, they will be replaced with a new one. After the replacement, the machine will calculate for the prize of any winning line. If you won again, the tumbling reel feature would take into effect again. It will keep doing this until there are no more line wins. Players tend to lose money easily because they do not approach the game with care. Betting the biggest amount, hoping to land the big win, is like winning the lottery. It is possible, but your chances are slim. So, does that mean you should not play slots? Not really. You have to play it but play it wisely. Just for perspective, take a look at a one-pay line, a three-reel machine that has ten symbols. In the first reel, your chance of landing a cherry is one out of ten, which is equal to 10%. The same is true for reel 2 and reel 3. Overall, your odds of landing three cherries in a row is 10% x 10% x 10% = 0.10%. What does this mean? It means that for 1,000 spins, you may land the cherry only once. If the jackpot prize for that combination is 1,000x your bet, it does not make sense to spend the maximum bet per spin as you would easily deplete your bankroll in less than five minutes. What you have to do is to wager the smallest amount, or an amount that you can sustain for 1,000 spins. In this example, betting £0.01 for a thousand times will only cost you £10. At this rate, you can win as much as £10 if you landed that jackpot, not including the wins you earned for other combinations. And you only need to pop £10 for a thousand spins. If your odds in a 3-reel and one-pay line machine is 0.10%, can you imagine what your odds are going to be in a 5-reel and 20-pay line slot? Only bet what you can afford. Just because a machine did not pay off the past spins does not mean it will pay on the next one; each spin is independent and has the same exact odds. You also need to know that the prize for a £10 bet per line is in the same proportion with that of a £0.01 bet per line. Of course, the value is going to be different. As with other investments, the value of what you earn depends on the value of what you invest. The higher you bet, the higher the value, but the risk is also higher than a small bet. You can choose to risk and lose a £1,000 per spin, or risk and lose £1 per spin. This is the choice you have to make. You can play Da Vinci Diamonds slot online for free on our website. There is no download required, and you are not going to install any software on your device. Our website is one of the best sites where you can access free slot games with no download. Here are the benefits when you play Da Vinci Diamonds slot online for free here. As you can see, playing free online Da Vinci Diamonds slot machine allows you to create your strategy and verify if it works. If it doesn’t work, you do not lose real cash. Your next move is to improve your strategy or change it altogether. You need to be online if you play it, as you will be accessing the game servers via the internet, even if the game is free to play. Once you have created a winning strategy, you can move on and play with real money. Look for an online casino that offers the game. It will help if you look for casinos that are partnered with IGT, the game developer. The next step is to check if the online gambling operator accepts players from your country or region. Casino game operators have licenses that cover different places. Once you have found a casino, check if you possess the deposit and withdrawal methods offered. Make your first deposit or claim your bonuses. Overall, this title from IGT is impressive despite its simplicity. It does not have complicated bonus rounds. The game is straightforward, and we highly recommend it for people who are just starting out on their slots journey. Despite the absence of a bonus round or a progressive jackpot, the player is compensated for getting free spins and having tumbling reels that will not stop until no more wins are available.